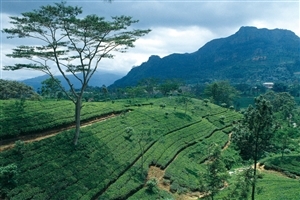 Make the most of some of the most unique accommodation available in Sri Lanka during the course of this nine day trip that encompasses some of the cultural highlights of the island nation before heading into the hills to explore the industry for which it is best known – including the chance to learn from a descendent of the man who introduced tea growing back in the 1860s. Arrive at Colombo International Airport to meet your guide before being transferred to Katugoda, where you’ll spend the night in an old colonial manor house, which has now been restored top provide boutique accommodation nestled amongst three acres of gardens. Spend the afternoon exploring the grounds of the hotel, take a dip in the pool or pay a visit to the spa to unwind after your journey. 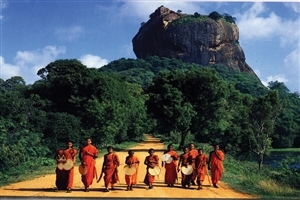 Head towards the centre of the island and the area known as the ‘Cultural Triangle’; which is home to a number of Sri Lanka’s World Heritage Sites. 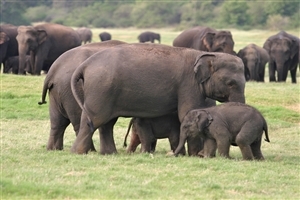 In the late afternoon, take a safari trip to see the elephants at the Minneriya National Park – with huge numbers present during the dry season when they head for the Minneriya Reservoir in an event known as the ‘Elephant Gathering’. More unique accommodation awaits at the end of the day, with a three-night stay at the stunning Vil Uyana resort. After a visit to a monastery hidden deep in the jungle for a blessing and an insight into life as a monk, climb Lion Rock to visit the stunning citadel that rises 200m from the forest around it. From the top, you’ll be able to look down on the moat and gardens that surround the huge granite stone. You’ll also have the chance to cast your eye over the ‘Heavenly Maidens of Sigiriya’, a range of ancient artwork to be found in the area. Take a journey back in time with a ride on a traditional village bullock cart through the local paddy fields before heading out onto the water for a catamaran trip. Admiring the countryside around you, you’ll take time to stop at a traditional farm before continuing onwards to a village house to spent time with a local Sri Lankan family. The afternoon is given over to a visit to the former Sri Lankan capital of Polonnaruwa, another of the World Heritage Sites and one famous for the ancient architecture that remains. Before departing the Cultural Triangle, you’ll call in at the Dambulla Caves Rock Temple, a network of caves dating back thousands of years and which feature an array of paintings and statues related to Buddha. A Spice Garden tour at Matala will then provide the chance to understand the taste and aroma of some of the world famous spices that can be found growing in the area. The day will end with you having arrived in the famous city of Kandy, where you’ll visit the Sacred Tooth Relic; one of the most important Buddhist relics in the country. 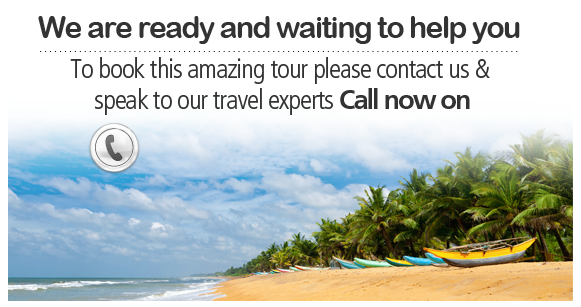 Return to the area around Kandy to visit the Peradeniya Botanical Gardens. Initially reserved for Kandyan Royalty, the gardens are now home to more than 4,000 species of plant and are a popular attraction with those keen to enjoy the stunning surroundings. Weather permitting, board a train for a trip through the many plantations found in tea country, and gain a glimpse of local life in the many small hill villages that line the route. Reaching your end destination in time for a three-course lunch, you’ll then be able to head out to explore tea country before returning to the Ceylon Team Trails Bungalows for your unique overnight stay. Gain an understanding of how Ceylon tea is made and learn the art of how to become a tea taster from the resident expert at your accommodation, Andrew Taylor. As a descendent of the man who planted the first tea seed in Sri Lanka back in 1867, he’ll give an informative insight into an industry that is now one of the most important for the island nation; with Sri Lanka being one of the top tea producers anywhere in the world. Visit the location of filming for the award-winning film Bridge on the River Kwai as you stop off at Kitulgala en-route to Colombo and the end of your trip, where you’ll depart for the return trip home.